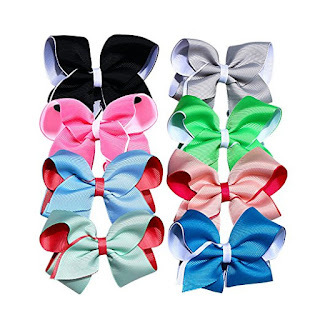 If your an Amazon Prime Member you can grab this 8 pack of 4in kids hair bows for ONLY $3.49 after code from gleam! The most popular newest double colors design 4 inches big hair bow clips for girls,teens,kids. Suitable for girls whose over aged 1 year old, perfect for bangs,ponytails and other hair decorations. 8 Different colors:black,hot pink,gray,lawngreen,blue,light blue,light green,light pink.Easily to match with different colors of dress and occasions. Best gift: Ribbon wraps the duckbill clip,it is safe to use.Perfect gift for girls,teens,kids,classmate on her birthday,christmas day or any time get together. 100% Satisfaction Guarantee: If you don't love it - *for whatever reason* - we'll replace it or give you back every cent. That means you'll love it, or it's free! Choose this cute hair bows for your girls today,click on the “Add To Cart” Button NOW. These double colors 4 inches hair bow clips are very popular in INS.These hair bow clips are made of high quality polyester ribbons,100% handmade hair bow clips.These hair bow clips are environmental,and harmless to anyone.There are 8 different colors,including black,hot pink,gray,lawn green,blue,light blue,light green,light pink.They are all very lovely and bright.You can use different color hair bow clips to match different dresses,it is suitable for every occasion and any season.Best gift for baby girls,teens,kids.We are very confident that you will be very satisfied with these hair bow clips!! *If alll codes are gone it will say REWARD ENDED.